My Vital (but often forgotten by creative mentors) Creative Tool – What is a Studio Journal and How do I use it? What is a Studio Journal all About? I love the eye candy of the popular and beautiful sketchbook journal as an art-form in its-self, but there is a little-known and incredibly useful counterpart to these, the studio journal. I also adore looking at sketchbooks to see how the artist wrestled with ideas visually to arrive at the finished work. Following all the twists and turns of the creative mind. Noting the ideas abandoned or yet to be explored. These things are illuminating and undoubtedly beautiful, but the studio journal is one piece of the artists kit is rarely promoted with such fever and gloss as the sketchbook journal or the artist’s sketchbook. It is the place to record the nitty gritty of creating: the dreams, fears, failures, successes (major and minor), possibly even moanings and gripes. The studio journal might not be glamorous, although your’s might be mine isn’t, but it is where the daily workings of the creative mind are recorded, melded, developed and refined. The studio journal is sometimes kept as part of the current sketch book, but I find that once writing invades my drawing sketchbook it nudges the drawings out of the pages. Words gum up my visual mind and it’s easier to get on with making art when their not clouding my thoughts. I prefer to keep my studio journal notes in an inexpensive separate notebook. This is the style I prefer, it’s basic and widely available from Wilko.com but I buy them by the boxful! What is really useful is an A5 or A4 diary, the dates let you know if you’ve checked in and the notes build into a useful document to revisit and mine in the future. Possibilities, ideas or projects that you may try. Meaning you have a relevant path of enquiry if your art tutor asks or the seeds of the next project once the current on is complete. The studio journal is extremely valuable for this and especially useful for warding off post-project-blues. Notes from tutorials – into the studio journal! Directed free writing for a specific period of time. The sort of brain dumps required when your mind has gridlocked or you need to go beyond your initial thought on a subject. The Date. Always add to the notes and reflect on why they are useful to you. Sometimes it can be useful to add other information like ISBN, web addresses, locations and page numbers. It is lovely to track an idea through sketchbooks and studio journals and see how they develop over time. Using a studio journal will extend and deepen your artistic explorations. If you are part of a guided learning program, your tutor or mentor may prompts you when to write or provide exercises for you to complete. I use my journal daily and find it is one of the most useful tools in my studio. It is important to find mental space when writing so that you can listen to the thoughts that get pushed aside by other’s opinions and the daily tasks and schedules that we juggle with. ♦It is sometimes good to write at the beginning of a project to research and test ideas. It can help you find different angles of approaching a theme and lead to a more insightful body of work. ♦I recommend to my clients using the studio journal more often towards the end of the creative project to analyze how the process is going and whether the work is reflecting the intentions of the artist. A common side effect of journaling at this point unearths hidden and new meanings in the work – a nice surprise! ♦Once the creative process has reached a natural stop or the artist has completed their goal, I advise to always do a reflective journal entry. Similarly, if group critiques are part of your creative life a reflective journal entry goes deeper than simply recording criticisms, comments and suggestions. This is an invaluable tool to developing your artistic meaning, vocabulary and leads to making meaningful works in a series. ♦Along with these suggestions, you may investigate specific questions, meanings or topics that arise during your creative process. So, what is a reflective practice? Creating work can be an exciting process, but we need to stop and reflect on what we’ve been doing from time to time. By asking ourselves questions in our studio journal we can gain insights about our artistic experience gives us a valuable opportunity to develop as an artist. 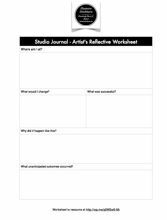 I will explain the questions I use to aid my reflective process during my journalling time and here is a free worksheet for my lovely readers. Right, let’s get down to some useful work. 1 Where am I at? What is my current situation? This section is not for judging your work or project, just give a very brief and factual outline of where you are in it. 2 What would I change? OK, now think of the things that you should, could or might change. It might be very practical ideas about materials or construction of a piece. It could also concern time constraints or budget adjustments that could be altered. Changes may be needed to the concept or line of inquiry during a project or piece of work. This is a great question. You can think purely in terms of grades or marks aimed for or reflect on your own personal goals. Even apparently tiny goals can make significant changes to your artistic progress. As ever, be kind to yourself and acknowledge the successes, that is a really important part of developing. 4 Why did it happen like this? Well? Were external factors important? Did internal issues promote or hinder the work? Was something else to be taken into account? Record it here. 5 What unanticipated outcomes occurred? What surprises, nice or nasty, did you experience? What can you learn from these surprises and are any of them useful for future development? 6 What would I do differently? This doesn’t have to be set in stone, take a moment to think about how you would do the project or work differently if given a fresh start. How could you be more efficient / focused / epically amazing? 7 Could they be improved? This is subtly ‘different to doing it differently’, this is improving. Doing something differently may take into account time pressures, but here we’re thinking about improvement. Could one or more specific qualities of the work be made better? 8 Was the content it important to me or the viewer? I like this question! It helps the creative be really clear about what and to who they are communicating. Any ethical or social concerns? This is another useful question to ask yourself. Sometimes an issue can arise during work that was previously not imagined and needs to be taken into account. Intentions or to do list actions! List a few key things from the journal writing above to take action on. You may be able to action some fairly quickly, but other points will re-surface or may for the structure of an entirely new future project. The great thing about your studio journal is that it is not an academic document and if you work outside of a formal learning environment it is your private sounding board. I am a fan of dating writing and if I’m doing a specific exercise I’ll title it too. You can write freely and record ideas that are edgy. There is no need to impress other people in your journal which can be a sanctuary from public sharing of your artistic ideas. You can follow set writing exercises (mine or other people’s) or create your own. If something surfaces whilst you are making art, jot it down and explore that at the end of the day. These collected thoughts can become parts of essays, statements and even art works themselves! choose a beautiful sketchbook to journal in, my top 10 are here – click!